The 194 steps leading to the top of The World Famous Horseshoe Curve use to be bit of a challenge for some people to climb. No more excuses, it now has its own incline plane called the "Funicular". This Pennsylvania Historical Attractions is also known as the 8th Wonder of the modern world. Even the roads leading to this Pennsylvania Historical Treasure has been upgraded. It's a beautiful scenic ride through the Allegheny Mountains and it only takes about 20 minutes from Altoona, PA and The Altoona Railroaders Museum. The convenience of riding the new incline plane to the top only cost a couple of dollars. If you are planning on visiting the Altoona Railroaders Museum the admission price to the museum includes the admission to the Horseshoe Curve. It's like having a coupon Buy One Get One Free! Now who can resist a coupon these days? Once you get to the top of the World Famous National Historic Landmark you'll see there are many places to rest. There are even picnic tables provided if you'd like to that a picnic along. It's so peaceful and exciting when you finally hear the rumble of the trains approaching. Have you heard about Altoona's best-kept secret? We have an Irish Pennsylvania Ghost sighting at the Horseshoe Curve. Shhh! Don't forget, it's a secret. 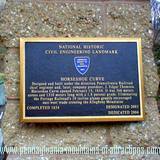 The 150th Birthday Celebration of The World Famous Horseshoe Curve was celebrated in 2004. It was an event the community looked forward to. Even though it ended up raining the entire day and the fog rolled in that evening the planned event was still celebrated in style. There was a beautiful light display that covered the entire length of the curve, along with music, and a spectacular fireworks display. The event lasted the entire evening, watching and participating in this celebration was a Pennsylvania Historical Event for all that attended. The 8th Wonder of the Modern World! The Horseshoe Curve opened to traffic February 15, 1854. When you see this National Historic Landmark in person you will find it hard to believe the project was completed in 3 years, by 400 Irish immigrants, using only hand tools like, picks, shovels, horses, and drags. The biggest challenge to the Pennsylvania Railroad was getting a train over the Allegheny Mountains. They had to figure out a way to connect from the East to the West. At first the thought of going through the mountains and building a tunnel seemed the answer. They took a gamble when J. Edgar Thompson, an engineer at the Pennsylvania Railroad came up with the design on building this famous PA National Landmark. His design to go over the steep mountain and build the tracks in the shape of a horseshoe to keep the tracks gliding along the natural formation of the Allegheny Mountains seemed unthinkable at first. 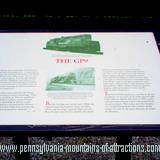 You may find it interesting to know it is documented in Pennsylvania History that this world famous Historic Wonder was on the top 10 hit list during WWII. The German's knew if they sent spies to sabotage this unique railroad formation it would cripple the United States and possibly allow them to win the war. 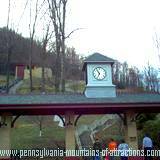 At that time The Horseshoe Curve was referred to as, "The Gateway To The West".